A Busy Week For Frank! Baseball's Winter Meetings don't begin until Monday but when Frank Wren arrives he will have already made more moves than most of his counterparts. Yes, Frank has had a very busy couple of days and if this week is any indication, the Braves will look very, very different next year. Even more different than I first envisioned. I think B.J. Upton is a great addition at centerfield. Don't get me wrong, I really, really wanted the Braves to re-sign Michael Bourn. I'm a huge fan of his and I was thrilled when the Braves made the trade for him. I loved the speed that he gave the Braves at the top of the order and the excitement he added on the base paths. It was something that the Braves had been lacking for quite some time. Keeping Michael in Atlanta wasn't going to be easy. He's the top centerfielder on the market and Scott Boras is his agent. Need I say more? B.J. Upton had previously been on the Braves radar and they made inquiries about him at the 2011 trade deadline. The Rays weren't willing to part with him and the Braves picked up Michael Bourn instead. B.J. was the second overall pick in the 2002 First-Year Player Draft by the Devil Rays and he made his big league debut in 2004. He spent 2005 in the minors and came up to the majors for good in 2006. He's a .255 lifetime hitter, batting .246 last year with 31 stolen bases, 28 home runs and a .298 on-base percentage. Bourn's stats from last year? He hit .274, with 57 stolen bases, 9 home runs and a .348 on-base percentage. With a five-year, $75.25 million deal, B.J. becomes the highest paid free agent acquisition in Braves history. He's the quintessential five-tool player. He possesses speed, perhaps not a much as Bourn but that evens out with the extra power he brings to the plate. B.J. is also a little younger than Michael and, as always, the Braves were hesitant to sign an aging player who's key asset is speed (like Bourn) to long term deal. B.J. Upton has his critics. Some say he's an underachiever but I disagree. In the past he's been criticized for making bad decisions during games but Rays manager Joe Maddon commented that B.J. has made better decisions on the bases this year and his game has matured. The numbers at the plate are impressive. B.J. hit his 100th career home run this season. With this accomplishment he joined an elite group of players who accrued 100 home runs and 200 stolen bases before turning 28. The others on the list include Barry Bonds, Rickey Henderson, Eric Davis, Hanley Ramirez, Bobby Bonds, Cesar Cedeno and Lloyd Moseby. One thing is for certain, the Braves didn't hold that line-drive that put Chipper on the D.L. for a month against B.J.! I'm not a bit surprised that the Braves traded Tommy Hanson. I saw that one coming and believe it or not, I actually called it. I liked Tommy a lot but he was always suffering from injury at the end of the season. He has an awkward delivery that neither he nor the Braves could ever correct. I think that took a toll on him phycially. He's in Anaheim now and the Braves received relief pitcher Jordan Walden in return. Today, the Braves non-tendered Peter Moylan and Jair Jurrjens, again, not a surprise. Who's gone from the 2012 team? Who's new to the 2013 team? Say It Isn't So Rossy! Did you think I had fallen off the face of the earth? Or perhaps I had sunk into a deep despair with the end of the 2012 season? 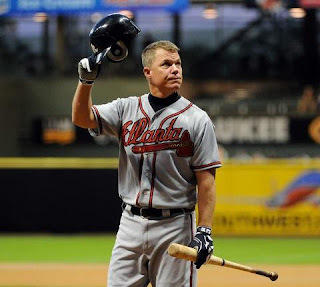 Or perhaps I couldn't bear to think about a Braves team without Chipper Jones? Truthfully, it's none of the above. Life got busy and I had to take another personal "rain delay". But now I'm back and in a state of shock. Braves back up catcher David Ross signed a two-year, $6.2 million deal with the Boston Red Sox. What!?! I'm shattered. For the past four seasons, David Ross and Brian McCann have made up the best catching tandem in all of baseball. The best by far. It didn't matter who was behind the plate, offensively or defensively, the team was just as strong with either player behind the dish. This was a fact that was commented upon regularly during national broadcasts. And with the injuries that plagued Brian McCann this season, David Ross was more valuable than ever. As great as his offensive numbers were this year, his game calling and defense were even better. It spoke volumes that Fredi Gonzalez chose to start David over Brian in this season's wild card game. David Ross wasn't just valuable on the field. He was equally as valuable, if not more so, in the clubhouse. He is a born leader. He was one of the most respected voices in the Braves clubhouse. He knew when to keep it serious and when to use his sense of humor. He was best at keeping it light and loose and keeping the team on an even keel. Bobby Cox loved him. That says it all. The Braves couldn't come close to offering the deal that the Red Sox did. The Braves, with their mid-market payroll, were looking to offer a one-year deal to a catcher who will turn 36 in March. The Red Sox, with a much larger payroll, are doubling David's salary. In fact, over the next two seasons, David will make just slightly less than he did in his four years with the Braves. As much I hate to see him go, I can't for one second blame David for making this move. He'd be crazy not to take it. David's departure leaves the Braves in a tough spot. Brian McCann will miss at least the first 2-4 weeks of the 2013 season due to shoulder surgery. Christian Bethancourt is playing great at Double A, but at only 21 is he ready for the majors? The Braves want to take it slowly with him. There's also Evan Gattis, although he hasn't played beyond the Double A level either. The most likely scenario? The Braves will go out and pick up a veteran catcher who is already playing at the major league level. One other thing to remember, the Braves just picked up the $12 million option on Brian McCann for 2013 but he will be up for free agency at season's end. Braves fans may see a lot of changes at the catcher's position over the next few seasons. All in all, I'm so sad to see the Braves lose a player, teammate and man like David Ross. He was great for the Braves and he's great for baseball. He represents the game well. I can only hope that when David Ross' playing days come to an end, he chooses the Braves organization to being his career as a manager. 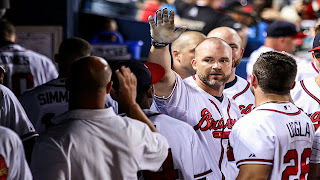 In four seasons with the Braves, David Ross played in 227 games. He batted .269 with 24 home runs and 94 RBIs. He had an on-base percentage of .353 and an .816 OPS in 663 plate appearances . In the 62 games he played in 2012, David Ross batted .256 with 9 home runs and 23 RBIs. Where Was The Real Justin? Ok, I'll admit it. Even before the first pitch was thrown, I had given the Detroit Tigers the win. How could they not? Justin Verlander was on the mound. Arguably the best pitcher in baseball, with three dominating wins and sporting a minuscule 0.74 ERA in the playoffs, the Tigers were going to be tough, if not impossible to beat in game one. I couldn't have been any more wrong. The standout pitching performance came from the opposite dugout. Barry Zito, the pitcher who didn't even make the Giants post season roster in 2010, pitched the game of his life. In his first World Series start, Barry pitched brilliantly for 5 2/3 innings, setting the tone for his team. He was followed by Tim Lincecum, who sat down seven straight batters, five on strike outs. It was a welcome sound to hear the Giants fans cheering so loudly and passionately for Barry Zito. He's had a tough time in San Francisco and the fans haven't always been kind to him. All the bad outings were forgotten tonight. He even joined in the scoring, driving in the Giants fourth run after getting a hit off of Justin Verlander in the fourth inning. This marks the fourth straight game where a Giants pitcher has driven in a run. Offensively, the game belonged to the Giant's Pablo Sandoval. He drove in half of his team's eight runs. With three home runs in his first three at bats, Pablo became only the fourth player in baseball history to hit three home runs in one World Series game. He joins Albert Pujols (2011), Reggie Jackson (1977) and Babe Ruth (1926 and 1928) Oddly, Pablo hit only 12 home runs during the regular season. Guess he was playing catch up tonight. Now the nagging question. Did the five day layoff after their sweep of the Yankees hurt the Detroit team? In 2006 the Tigers had almost a week off after winning the ALCS. The Cardinals went on to beat the Tigers four games to one in the World Series and many felt that the rest did the team more harm than good. The Giants came into the World Series with only one day off and whole lot of momentum, including the high of suviving six elimination games. Perhaps the Tigers rest only led to rust. Let's see if they can shake it off tomorrow night. This World Series marks the first since 1954 where the AL and NL batting champs are facing each other. Miguel Cabrera and Buster Posey won the titles this season. In 1954 it was the New York Giants Willie Mays and the Cleveland Indians Bobby Avila who wore the crowns. A 10 On The Richter Scale! No, that wasn't an earthquake. It was the Giants fans jumping up and down at AT&T Park. They are loud, proud and over the top! Nothing in baseball is more exciting than a Game 7, especially in the LCS! It's the ultimate win or go home!! So which team do you think is going to keep playing? 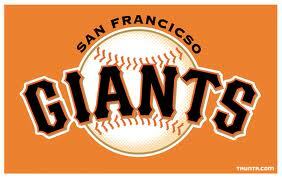 Will it be an orange-on-orange World Series or will it be a repeat of the 2006 World Series? Congrats to the Detroit Tigers, champs of the American League and the first team to make it to the 2012 World Series! It's kind of funny, at the start of the season the Tigers had been picked to win their division. After getting off to a slower than expected start, in many All-Star break polls they were oft-mentioned as one of the mid-season's biggest disappointments. At the end of the season, not so much. Without a doubt, the Tigers played head and shoulders above all the other American League playoff teams. 2011's American League Cy Young winner and MVP, Justin Verlander was absolutely brilliant. Miguel Cabrera showed a national tv audience how and why he won the triple crown and Phil Coke stepped in when his team needed him like never before. The A's took the Tigers to five games in the division series but they were unstoppable in the ALCS. 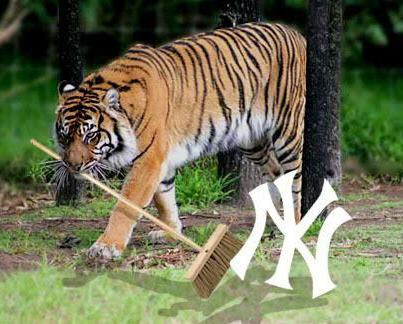 The Tigers sent the Yankees back home without a win. In fact, throughout the series the Yankees never had the lead in any of the four games played. Not even once. In 27 1/3 innings the team with baseball's highest payroll score only two earned runs. They were humiliated. Yet, in all of this, there is something disappoints me terribly. The local and national coverage that the Tigers got, or should I say, didn't get. It seems that everything that I saw and heard the day after the Tigers sweep of the Yankees was not about the Tigers victory. It was all about the Yankees loss. From Derek Jeter's fractured ankle, to A-Rod's lack of hitting and subsequent benching, to the sub-par pitching performances to everything else under the sun, once again, the Yankees grabbed the headlines. C'mon guys, give the Tigers their due. They've earned your respect and more importantly, they deserve it. 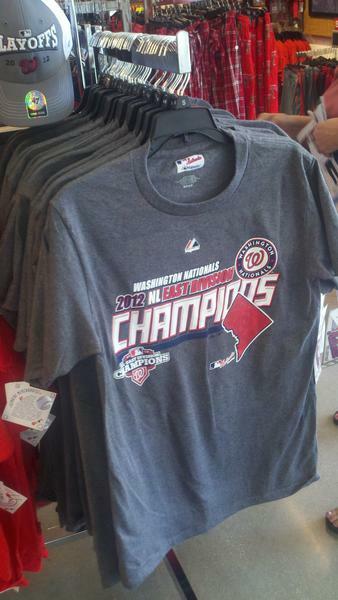 Two years ago, the Washington Nationals went on a spending spree. They signed Phillies free-agent outfielder Jayson Werth to a $126 million, seven year deal. The pundits criticized the team, saying they way over-paid for a good bat and a strong veteran presence on the team. Werth had a disappointing season in 2011 and the criticism continued. In April of this season, while attempting to make a diving catch, Werth broke his right wrist. He missed three months of the season. More criticism. Last night, the Cardinals were up 2-1 in the National League Division Series and needed only one more win to advance to the League Championship Series. The game versus the Nationals was deadlocked at 1-1 for the majority of the game. In the bottom of the ninth, Jayson Werth hit a walk-off home run, forcing a game five. In that moment, Werth became worth every penny. I'm still at a loss. I can't get my head around what happened at Turner Field Friday night. I was confident that the Braves would win. The way the game unfolded? No words. I will say this first. The Braves were not at their best. Three errors and ten left on base leaves a team at a huge disadvantage. But what about momentum? The Braves had it on their side in the eighth inning. And then it was lost on a call. A call that will live in infamy. Down 6-3 with runners on first and second with one out in the bottom of the eighth, Andrelton Simmons hit a fly ball into the outfield. The outfield. The ball dropped between outfielder Matt Holliday and shortstop Pete Kozma. 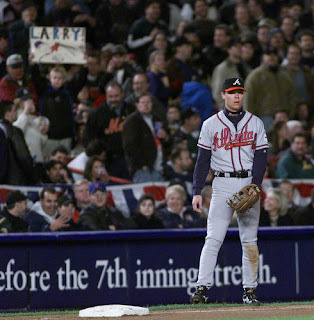 Braves fans went nuts! The bases were now loaded with Brian McCann stepping in to pinch hit. Momentum was on our side! Then the unthinkable. The bizarre. The unexplainable. Left-field umpire Sam Holbrook called it an infield fly. WTF!?! The ball was a good 60 feet into the outfield. Now instead of having the bases loaded with one out, the Braves had runners on second and third with two out. The shift of momentum had begun. Braves fans were incensed and it was made known! It was like nothing I've ever experienced. A barrage of cups, beer cans, coke bottles and trash were all thrown onto the field to a soundtrack of shouts, curses and screams. The game was halted. The players cleared the field and the grounds crew cleaned the debris. Eighteen minutes later play resumed. The momentum had shifted 180 degrees. Yesterday and today I read and watched everything that I could about the incident. I knew what I thought and felt about everything, both the call and the reaction. But what about those who are more knowledgeable than I? Was it the right call? Were the Atlanta Braves fans a disgrace and an embarrassment? I needed to know. From my "research", baseball insiders and analysts were divided 50-50 on the veracity of the call. The infield fly rule is, in itself, vague. To have it have such massive implications on a game of such importance is unacceptable. Something has to change. As for the reaction of Braves fans, I'm proud of my peeps. Atlanta fans have been criticized for decades for not being "good fans". Friday night our passion shone through. What I find funny, is that if this had happened in either New York or Philadelphia, it would have been acceptable. It's ok when Yankee or Phillies fans react strongly. But Atlanta fans? Apparently not. And now on to my other point of contention. The one game playoff between two wild card teams. It's wrong. Two teams that play 162 games in a season SHOULD NOT have their seasons hinge on one game. Football, sixteen games, one game playoff, yes. 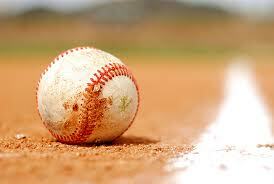 Baseball, 162 games, one game playoff. NO. My feelings regarding this don't stem from this game. Revisit my post from March 11, 2012. I didn't like it then and I don't like it now. I'm realistic. Before the incident, the Braves had already dug themselves a pretty deep hole and the Cardinals were playing well. But in the eight inning the Braves were digging themselves out of that hole. Just like they had done so many times throughout the season. Would the Braves have won without the infield fly call? No one knows. That said, as the Cardinals celebrated their win in the locker room they weren't chanting "happy flight." They were chanting "infield fly." Extra Butter On That Popcorn Please! I love a good baseball movie and I'm totally stoked about this one! 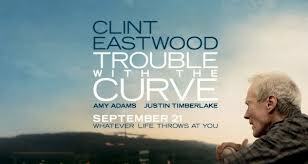 The film is "Trouble With The Curve" and it stars the coolest guy ever, Clint Eastwood. I know for certain that I, as well as audiences everywhere, will not be disappointed because Clint Eastwood does not make a bad movie. He doesn't know how to. It's just not in him. Ok, once again I'm being a total homer and as you can tell, Clint is my absolute fave. In "Trouble With The Curve" Clint portrays an aging and ailing baseball scout. He's at the end of his career and he takes his daughter along on one last recruiting trip. The film also features Amy Adams, Justin Timberlake, John Goodman and Robert Patrick. Atlantans may see some familiar sites on the screen as the movie was filmed in and around Atlanta, Athens, Macon, Dawsonville and Young Harris. The film opens on September 21st. Here's a preview! It's being called the biggest trade in the history of the game. Over the weekend the Boston Red Sox sent Adrian Gonzalez, Josh Beckett, Carl Crawford and Nick Punto to the Los Angeles Dodgers. In return, the Dodgers sent James Loney, Ivan DeJesus, Allen Webster, Rubby De La Rosa and Jerry Sands to Boston. This is an intriguing trade and it shows two very different schools of thought. The Dodgers immediately strengthened their team but they also took on $260 million in salary debt. That is absolutely massive! The new ownership team is making a bold statement to both their fan base and all of baseball. They want to win, they want to win now and money is no object. Ownership wanted to assemble a better team and they were aggressive. They're certainly taking some chances but as Braves fans know, Dodgers team President Stan Kasten knows a thing or two about building a winning franchise. And don't forget, in addition to the players listed above, the Dodgers also recently picked up Hanley Ramirez and Shane Victorino. How will the Dodgers absorb all of this debt? A good chunk of it will be taken care of when they re-up their television contracts. I've heard the team referred to as "Yankees West" and I don't think that moniker is too far off. On the other coast, the Red Sox have totally blown up their team. They are, in essence, starting with an almost clean slate. The changes began in the off season, from the top on down. A new GM and manager weren't enough to create a better atmosphere or a winning team. Boston fans have to be shell-shocked. I don't think the city will see the glory of the 2000's for quite some time and I'm certain that that won't sit well with them. All this said, in everything I've watched, heard and read, GMs from both leagues almost unanimously agree that the Red Sox got the better end of this deal. They freed up hundreds of million of dollars and have now gained the ability to be very active on the free agent market in the upcoming off season. Maybe Boston won't have to wait as long as I thought for their turn around. In digesting all of this, I was struck by one incredible comparison. During the last month of the 2011 season, both the Red Sox and Braves had massive, unimaginable meltdowns. It's truly fascinating to compare how each organization responded to their catastrophe. With the steady and calm resolve that the Atlanta front office is known for, there didn't seem to be any signs of panic or knee-jerk reactions. I'm not staying that it was all rainbows, fluffy clouds and unicorns. In fact, I'm fairly certain that behind closed doors there was a lot of anger and yelling going on. But then I also know that the Braves are right back in the playoff hunt again this year. And that's how I know that the Braves reacted in the right way. Baseball umpires are a nameless group. That's how it's suppose to be. They're an impartial group of men who enforce the rules of the game while blending into the background. Most folks, even those who love baseball, can rarely call an ump by name. If they can, it's usually because of something negative, a blown call, an odd strike zone or the memory of a favorite player or manager being tossed. Jim Joyce has been a major league umpire for 24 years. 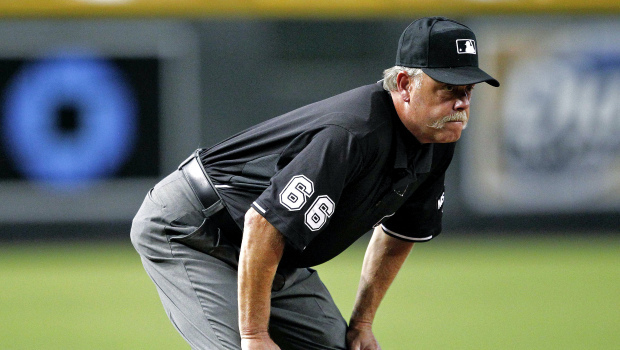 In a 2010 poll, the MLB players named him the best umpire in the game. He's umpired in two World Series, three League Championship Series and six Division Series. Yet, what he's most famous for, or perhaps infamous for, is a blown call. A call that cost Tiger's pitcher Armando Galarraga a perfect game in the 2010 season. After watching a post-game replay, Joyce knew he blew the call and the enormity of what he had cost the player. Joyce immediately went to the Tigers locker room and apologized to Galarraga. Galarraga said he had no ill feelings toward Joyce after he acknowledged missing the call and apologizing. Now, perhaps Jim Joyce will be remembered for something so much better. Last Monday night, Jim Joyce was credited with saving the life of a game-day food service employee at Chase Field in Phoenix. Joyce and his crew had just arrived at the ballpark and were headed to their dressing room when they saw Jayne Powers on the ground having a seizure. Joyce rushed over to help, protecting Powers' head. Suddenly the seizure stopped and Joyce could tell that Powers had stopped breathing. He began administering CPR, a skill he learned in high school. Jeff Urgelles, the Marlins bullpen catcher and a former firefighter and paramedic was called and assisted Joyce. Paramedics arrived moments later, twice using a defibrillator while Joyce continued CPR. Powers was rushed to the hospital. Doctor's have installed pacemaker and she is already recovering at home. Joyce and his wife had a very emotional visit with Powers in the hospital on Tuesday. Although Powers memories of the incident are hazy, she did remember the sound of Joyce's voice. As for his actions, Joyce said instinct took over. "I knew something was wrong," he said. "And I knew if something wasn't done, this lady could actually die in front of me. It was more instinct than anything else." That was one head's up play Jim Joyce. For certain, you are one true, blue angel. I'm a half-full person. I like to stay on the sunny side of things. I'm a realist but I always try to look for the positive in each and every situation. I always think that something better is just around the corner. Tonight, I hope to God that it's a Braves win over the Nationals. Or even just some hits. Ok, I know that didn't sound very positive. The Braves have frustrated the bejeezus out of me for the past two nights. This is the proverbial crunch time. These are games that need to be won. Games that must be won. So much ground can be made up by beating the Nats. Yet, as it's been since their inception, the Nationals have the Braves number. The Braves can't seem to win against them. And now these losses matter more than ever. What do I really want to see? I want to see Dan Uggla and Brian McCann hit the freakin' ball. Last night, in the top of the ninth, the Braves had Jason Heyward and Freddie Freeman on the corners with no outs. Dan Uggla was due up, then Brian McCann. Half-full me, sitting on the couch, knew that the game would be on the line with Juan Francisco at the plate and two outs on the board. Yep, I was right. And I'm certainly not bragging about being right. More than anything, I wanted be totally wrong. I wasn't. Dan Uggla is hitting .208 and he's been slumping at the plate since before the All-Star break. I haven't called him out because he's been consistent in the field. He's made some absolutely stellar plays and he hasn't made excuses for himself during his slump. That said, let's remember, Dan Uggla is paid to play both defense and offense. Mr. Uggla, we want some offense. Now. Brian McCann is hitting .229. His offensive slump has been going on since last August. I appreciate everything about Brian McCann but his lack of production is wearing on me. The rest of my comments? Just read what I wrote for Dan Uggla. When the wheels came off last September, every player except one seemed to slump. Chipper Jones was that one player who brought it every night. He did his best to carry the team but one player can only do so much. This year, there are other players, along with Chipper, who are contributing. Mr. Uggla? Mr. McCann? Care to join in? Can It Be Any More Storybook? It's just a bobblehead. A knick-knack. A dust collector. Something for the kids. Last night it was different. It was a Chipper Jones bobblehead, given away during his final season. How could you not go to the game? And how could you not expect more magic? I was there. I expected magic. I know I sound like a total homer. I know I write about Chipper a lot. Here's the deal. I know what I'm seeing and I'm appreciating it in the moment. I'm not going to be one of those people looking back and then, after the fact, realize how fortunate I was. I totally get it now and I want everyone else to do the same. Thursday afternoon had fans arriving early, not a common occurrence at Turner Field. The boxes of bobbleheads were stacked high and people were lined up at the gates before they opened. There was extra excitement in the air and a whole lot of energy everywhere. So when the man of the hour stepped up to the plate in the bottom of the first inning, there were hopes that he'd give fans something special that night. He did. On a 3-2 count, Chipper hit a Jason Marquis slider over the right field wall. Atlanta fans are pretty laid back but this home run made the ball park erupt. It even rattled Chipper. It rattled him to the point that once back in the dugout, his hands were shaking and he spilled a cup of water all over the front of his jersey. Then a curtain call. In his third at bat, Chipper took Jason Marquis deep once again. That hit was hit number 2,700 of his career, placing him at number 32 on the all-time hit list, just ahead of Dave Winfield. A milestone hit and it was, of course, a home run. It just had to be. The Braves do it right. 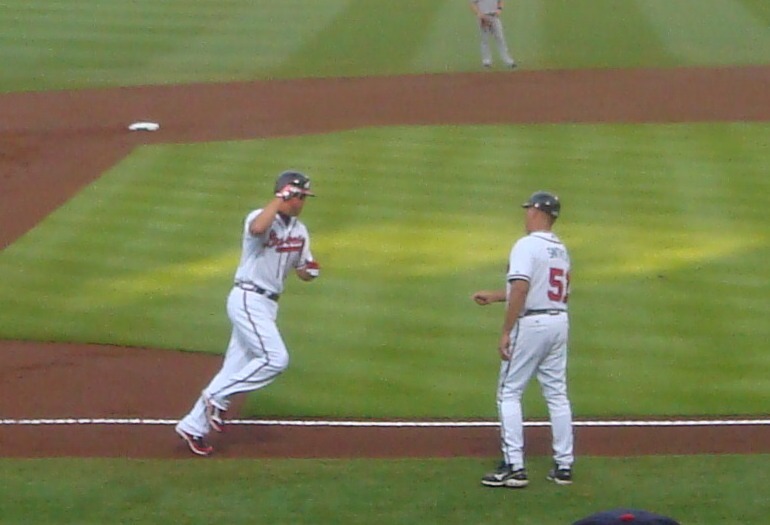 The music from "The Natural" played as Chipper rounded the bases. The milestone was marked on the massive BravesVision screen. And after high-fives and hugs from his teammates, the man of the hour was pressed into a second curtain call. 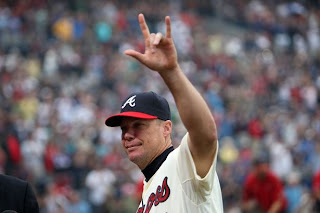 Is there a Hollywood script writer hiding somewhere deep in the bowels of Turner Field, cranking out magical storyline after magical storyline for Chipper Jones? I swear there has to be. This can't be real. But it is. Chipper's first HR of the game. Photo courtesty of me! The Braves won 6-0 over the Padres with stellar performances all the way around. Kris Medlen's pitching was nothing short of brilliant! He's 4-1 and there is absolutely no way that he can be put back into the bullpen. We'll see what happens with this six man rotation but I think it will be Mike Minor who's pushed out of a starting role. Great glove work in the field came from Paul Janish, Chipper, Dan Uggla and Freddie Freeman. Paul Janish's sliding fielding play to throw out Carlos Quentin's in the top of the ninth was amazing! What a smooth move by Frank Wren to bring him in. Jason Heyward's home run in the bottom of the third was his 20th of the season. He hit 18 homers in his first season and 14 last year. Jason has definitely left 2011 far behind him. This was Chipper's 40th multi-home run game and his first since 2009. He has the second most multi-home run games for a switch hitter in baseball history, just behind Mickey Mantle's 46. Chipper now has 466 career home runs. He is the fifth Braves player to a have a multi-home run game at the age of 40 or older. He's certainly in fine company! Babe Ruth (1935, 3 HRs), Hank Aaron (1974), Darrell Evans (twice in 1989) and Julio Franco (at age 46 in 2005). One of Atlanta's local television stations aired an interview with Braves third baseman Chipper Jones yesterday morning. Truthfully, I don't always enjoy interviews with superstar athletes when they're done at the local level. The interview sometimes gets a bit cheesy. Not this one. WXIA's Brenda Wood asked some great questions, nothing earth shattering but good questions nonetheless. From his baseball heroes, to sacrifice and personal failings, to his tattoos, life after baseball and what he'll miss most, Chipper was extremely honest and open. He seemed very at ease. I hope all of you enjoy this as much as I did. 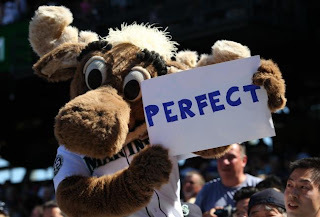 Congratulations to the Seattle Mariners' Felix Hernandez for throwing a perfect game yesterday. King Felix pitched masterfully, showcasing his exquisite command of each pitch in his vast and lethal arsenal, reminding us once again why he's one of the elite pitchers in today's game. He threw 113 pitches, 77 for strikes, and he struck out 12 batters. In a season that's already been dubbed the year of the pitcher, this is the third perfect game we've seen. That's in addition to six no-hitters. With six weeks left in the season I wonder what else is on tap? As for the Tampa Bay Rays, they were on the losing end of this one. The Rays have been in existence for 15 seasons. In that short time, they've had three perfect games thrown against them and been no-hit five times. Sorry Jenna. Melky Cabrera. Suspended 50 games for testing positive for a banned substance. In essence, he's out for the rest of the season. Melky had seemingly turned his game around this year. Now we may know how. He was having an MVP calibre season, batting .346 with only Andrew McCutchen of the Pirates hitting better. He was also named MVP of the All Star Game. The Giants are in the midst of a firey division race, only one game back of their bitter rival, the Dodgers. Cabrera's selfishness has not only dealt his team a major blow but he has, no doubt, cost himself financially on the open market as he is a free agent at the end of the season. In hindsight, maybe this explains Melky's bush league antics when the Giants were in Atlanta. 'Roid rage perhaps? Either way, what a dope. Melky doesn't deserve a photo. 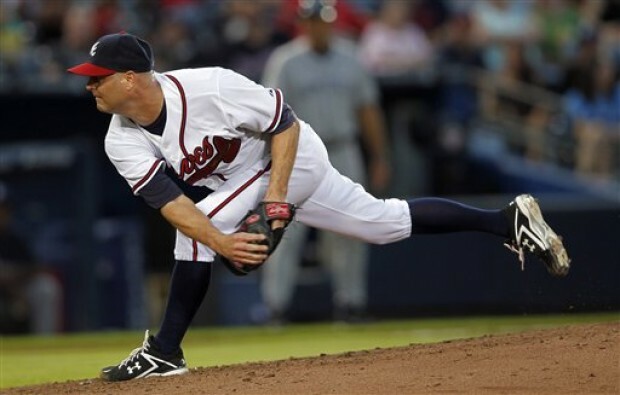 Tim Hudson hasn't worn his socks high since his days at Auburn and early on in the minors. Last night, he said he was trying to tap into the fountain of youth by wearing them high once again. Those socks certainly worked their mojo as Huddy pitched a stellar game and led the Braves to a 6-0 win over the Padres. Add that to a Nats loss and the Braves are 4 1/2 back in the east. At 37 years old and pitching in his 14th season, Tim Hudson looks anything but old. He may have a cranky ankle (not a cankle!) that barks at him every so often but if you look at the numbers Tim Hudson is, without a doubt, the most underrated pitcher in baseball. Braves fans know it. A's fans know it. My friend Julian knows it. What about everyone else? Huddy came back strong after his 2008 Tommy John surgery and he's had just as strong a comeback from back surgery this past off-season. His stats so far? In 2012 Tim Hudson is 12-4 with a 3.59 ERA, opposing batters are hitting just .241 against him. He's pitched 128 innings in which he's struck out 79 batters and walked only 35. He's pitched one complete game and has three shutouts. Huddy got his 100th win as a Brave versus Houston earlier this month, a team he's never lost to. Tim Hudson is 193-101 with a lifetime 3.41 ERA. Opposing batters have hit .248 against him. He's pitched 2,631.1 innings and struck out 1,778 batters. He's walked 797 batters, 75 of which were intentional. He's tossed 25 complete games and 13 shutouts. How do these numbers compare with his contemporaries? Let's see. And since Tim takes such pride in his hitting, I tossed batting averages in there too. After comparing the numbers, you have to agree. Whether the socks are high or low, Tim Hudson is the most underrated pitcher in baseball today.